There once was a young man named Gabriel Eduardo Carpio Sergiacomo who adored putting pencil and brush to paper. But as he grew older, his path deviated and he abandoned the physical tools of his art to explore the realms of graphic design and digital illustration. But lo and behold, he discovered designer toys, their sculptural shapes calling for him to decorate them, to reacquaint himself with the pencil and brush. Doing so, his first ventures seem in retrospect like experiments, simple steps towards understanding how best to adorn these forms. But once he was confident, which came quickly, his mind wandered to far-off Japan while his body stayed in his native Venezuela, and it was there that the Oni, red of skin and hot of temper, called to him, claiming the artist as its own. And while the broad strokes of the above legend are accurate, the artist commonly known as Gabriel Carpio is, to the best of anyone’s knowledge, not under the influence of an ancient Japanese ogre-like creature. But there is something about their appearance, complete with tiger’s teeth and great manes of hair, that the artist has been attracted to repeatedly throughout his career, to the point that he is sometimes known by the alias RedOni. And beginning with his hand-painted Oni-Mecha piece for Freak Store‘s I LOVE MUNNY 1.0 event, this is a direction that Carpio has rarely strayed from significantly. Continuing to primarily explore this subject, Carpio has refined his executions over the years, encompassing more detailed elements into his crisp and clean hand-painted renditions. For the most recent additions to his oeuvre, Carpio revisited his interpretation of the demon-like oni (鬼) on five similarly decorated 3-inch tall Dunny figures each of which are titled Mikura, all topped by cartoonishly skull-shaped adornments on their black horns with more abstract renditions of the same formed upon their chests. Similarly, Carpio has created a unique 5-inch tall Dunny titled Ne Ken, delicate sakura blossoms floating on its sides, an intricate webbing of painted textures lending way to a more realistic skull upon its belly. With one of its ears altered to appear as a sword’s hilt, the other proclaims the beast’s name — red oni (赤鬼) — with a wrapping of cloth at that ear’s base providing an organic flow to the whole. 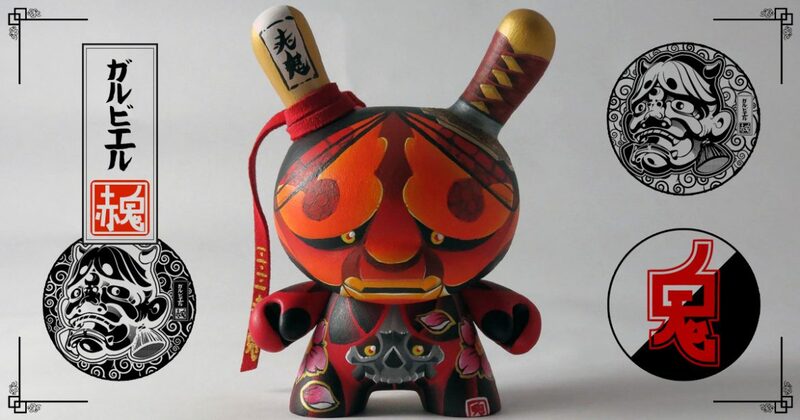 Remaining within his exploration of Asia’s rich history and culture, Carpio has decorated a Kidrobot produced Bub form in the masked likeness of kabuki theatre’s rendition of Kamakura Gongorō Kagemasa from Shibaraku, bold red-and-black decoration upon its white face. Titled Billy, this piece is hand-painted to appear tattooed, a tiger and dragon emerging from inside its golden Buddha head adorned vest, a handmade wood and fabric sword clenched in its hand. Additionally, Carpio also created a pair of 3-inch vinyl Dunny forms in the likeness of kappas (河童), impish water creatures from Japanese folklore. Appropriately titled Kappa and Kappa-buki, this hand-painted set each mirror and balance one another through their varied coloration and shared traditional turtle-like anatomy, a slightly menacing appearance emerging from their expertly executed decorations. And while the looming presence of the oni isn’t directly foreign this uniquely made pair or the kabuki-inspired piece, they are all obviously tied to Carpio’s larger body of work by being further explorations of a foreign land’s mythology and society that the artist obviously loves. Click Here to Acquire one or more Works by Gabriel Carpio.